The crisis surrounding the disappearance of Saudi journalist Jamal Khashoggi after entering the Saudi consulate in Istanbul over two weeks ago has not subsided. An uninterrupted flood of news and analysis from all quarters helps fuel the controversy and makes it difficult for observers to discern the truth. The evidence remains paltry, even after two weeks, while statements are conflicting, including many from the same source, and the issue, itself, has become an arena in which diverse parties are flagrantly advancing their own political ends. Articles in the British press started to call for the abdication of Saudi Crown Prince Mohamed bin Salman even before official investigations were launched into the Khashoggi disappearance. If official Saudi quarters ignored such calls, Saudi Twitter users initiated a hashtag campaign in support of the crown prince. The hashtag was retweeted more than 200,000 times by the end of last week. Other Saudis launched a hashtag in defence of Saudi Arabia several days before this. The authors held that neutrality in times of crisis was “treason”. If the #Jamal_Khashoggi_kidnapping was retweeted more than 200,000 times during the past two weeks, hashtags in support of the Saudi Kingdom and its leaders have outnumbered them. The pattern was not limited to Saudi Twitter users. It extended to a number of Arab countries, such as Egypt, the UAE, Bahrain, Kuwait, Jordan as well as North African Arab countries. As for the few available facts, US President Trump’s first reaction was to vow “severe punishment” of Saudi Arabia if it was established that Khashoggi was murdered. A few days afterwards, Trump ventured that “rogue killers” may have been responsible for the Saudi journalist’s presumed death. Trump also said that he had seen a news report suggesting that Saudi officials might admit that the missing journalist had died during an interrogation that was conducted without permission. But “who knows?” he added. The news led Trump to send Secretary of State Mike Pompeo to Riyadh to meet with the Saudi monarch. Pompeo arrived in the Saudi capital Tuesday. The top American diplomat “reiterated US concern over Jamal Khashoggi’s disappearance”, according to State Department Spokeswoman Heather Nauert. Pompeo later met the county’s powerful Crown Prince Mohamed bin Salman and is due Wednesday to visit Istanbul, where a joint Turkish-Saudi investigation is under way. Riyadh has cautioned that it would meet any measure against it with a harsher one. The warning was issued after a number of prominent economic and media figures and organisations announced their intention to boycott the Future Investment Initiative Conference, dubbed “Davos in the Desert”, scheduled to be held in the Saudi capital 23-25 October. One of the boycotters is World Bank President Jim Yong Kim, according to Reuters citing a senior official at the bank. However, according to other reports, Kim, who was listed as a speaker, is unable to go to Riyadh because of a “scheduling conflict”. IMF Director Christine Lagarde, on the other hand, does plan to attend the high-profile economic event. 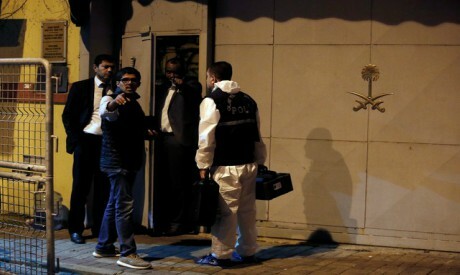 Meanwhile, in Istanbul, investigators, who arrived in a motorcade of six cars late Monday, left the premises of the Saudi consulate in the early hours of Tuesday after an eight-hour search, an AFP correspondent reported. They took samples with them, including soil from the consulate garden, that was loaded into vans, one official at the scene said. A Saudi delegation had entered the consulate one hour before the Turkish police arrived and appeared to still be inside as the search was conducted. Police plan to conduct a second search, of the Saudi consul’s home in Istanbul, later Tuesday. A Turkish security official, cited by Reuters, revealed that Turkish police have “an audio recording that indicates that Khashoggi was killed in the Saudi consulate”. According to unnamed sources, the Turkish police have Khashoggi’s Apple Watch, which was paired with his iPhone and recorded the interrogation and torture to which he was subjected. A number of experts interviewed by the BBC deny these reports, saying that the technology as described by the “anonymous” sources does not exist yet. Also, Khashoggi did not have his phone with him inside the consulate. He had left it with his fiancée who was waiting for him outside. The Turkish President Recep Tayyip Erdoğan, on Tuesday said police who entered the consulate for the first time Monday had found some surfaces had been painted over. “My hope is that we can reach conclusions that will give us a reasonable opinion as soon as possible, because the investigation is looking into many things such as toxic materials and those materials being removed by painting them over,” he told reporters. For their part, Khashoggi’s family, who said they have been left to “sadly and anxiously follow the conflicting news”, on Monday called for an independent investigation into his disappearance. “The strong moral and legal responsibility which our father instilled in us obliges us to call for the establishment of an independent and impartial international commission to inquire into the circumstances of his death,” a statement issued by the family read. The call was echoed Tuesday by UN High Commissioner for Human Rights Michelle Bachelet, who urged Ankara and Riyadh to waive diplomatic immunity in the case and “reveal everything they know about the disappearance and possible extrajudicial killing” of Khashoggi. It appears that there remain unknown dimensions to the Khashoggi case, but it should not be too long before the mystery becomes clear.